The general rule is that if it has pollen, you can probably make honey out of it. Honey bees look for flower nectar and pollen to feed on and, depending on the time of year and region, different sources may be available. Citrus blossoms are one such source of delicious nectar and pollen that honey bees feed on and store to live off during winter in the form of honey in honeycombs inside their hives. Orange blossom honey is a variety of monofloral honey produced when bees collect nectar and pollen from orange tree flowers and, possibly, other citrus species in bloom at the same time and located in the same region. Although it is labelled as monofloral and should be, orange blossom honey may actually be a mix of honey made from multiple citrus species. For example, if bees are relocated to an orange tree orchard when flowers are in bloom, but there are also other citrus plants in bloom in the same area, the bees will most likely visit all citrus species in the area. This means that it is possible for orange blossom honey to contain nectar and pollen from more than one citrus variety, but when orange blossoms are the main source of the honey, the end product can be labelled as monofloral orange blossom honey. If there aren’t any other flowering plants except for orange trees in the area and the nectar source is plentiful, the bees will collect everything they need from this one source and produce an exclusively monofloral honey. Generally, beekeepers chose where to relocate their bees very carefully and take into account various factors, depending on the type of honey they want their bees to produce. So if the aim is for them to make orange blossom honey, the bees will be moved to orange tree orchards that should offer a plentiful supply of nectar for a set period of time, making sure there is no competition from other hives or floral sources. Also, old honeycombs with honey from other flower sources will be removed prior to this, to further ensure purity, quality and a monofloral product. What does orange blossom honey look like? This particular variety has a somewhat pale, light golden, almost whitish color. The purer the honey (very little or no contamination from other floral sources), the lighter its color should be. What does orange blossom honey smell and taste like? The variety has a somewhat weak, but distinct citrussy smell and an overall fresh aroma. It tastes surprisingly sweet and has a delicate, slightly acidic flavor, with a taste reminiscent of citrus fruit. The raw unprocessed honey has a thick, viscous consistency indicative of a low moisture content and an intense flavor, while the processed honey loses its consistency and much of its flavor, becoming ,ore liquid and sweet tasting, with no particular flavor. Processing causes the honey to also lose most of its benefits. Moreover, orange blossom honey tends to crystallize rapidly compared to other varieties like acacia honey or pine honey (fir tree honey) which crystallize very slowly. 1) Antimicrobial action. 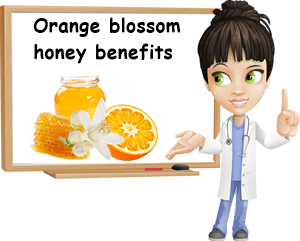 Orange blossom honey boasts strong natural antimicrobial properties that recommend it for a variety of uses, from wound healing to improving the appearance of acne and acne scars and treating respiratory tract infections by reducing bacterial load. The antimicrobial properties of the honey also explain why it is employed for the treatment of H. pylori infection in combination with ingredients such as ginger or propolis and antibiotic treatment. 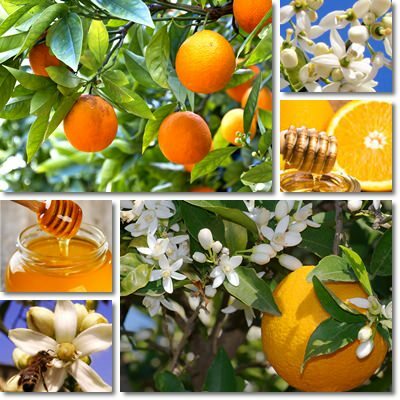 What makes orange blossom and other types of honey posses antimicrobial properties is their hydrogen peroxide content, followed by their acidic pH and low moisture content. 2) Helps eradicate H. pylory infection. Research looking into how honey can help eradicate H. pylori infection reveals that when honey comes into contact with gastric juices, it releases hydrogen peroxide, a strong disinfectant and antiseptic, acting directly at the site of the infection (The Antibacterial Activity of Honey on Helicobacter Pylori). Moreover, hydrogen peroxide has been found to encourage healing of the stomach lining, further contributing to recovery from H. pylori infection. It has also been theorized that honey enhances the potency of antibiotics, hence its beneficial action. 3) Soothing on the stomach. The soothing action of orange blossom honey and other varieties is attributed to both the thick, viscous consistency of the honey and its antimicrobial action. The particular consistency of the honey makes it stick to mucous membranes, forming a protective coating that shields from harmful elements and allows the mucous membranes to heal, reducing inflammation and irritation at the same time. For gastritis and gastric ulcers relief, it is recommended to have 1-2 tablespoons of raw, unprocessed, unheated honey and postpone eating or drinking anything for at least 30 minutes to 1 hour. The honey is best consumed upon waking up in the morning on an empty stomach. Moreover, research on the effects of honey on H. pylori infection shows that hydrogen peroxide in honey encourages healing of the stomach lining, further contributing to improving certain digestive conditions such as gastritis or gastric ulcers, as well as occasional inflammation or irritation of the stomach lining. 4) Great for sore throat and bacterial respiratory infections. Orange blossom honey is great for a sore throat because it helps calm irritation, reduce pain and discomfort and relieve cough. With its viscous consistency, it sticks to the throat lining, forming a protectice coating that allows the mucous lining to heal. Moreover, its natural antimicrobial action reduces bacterial load, making it a good natural remedy for respiratory tract infections of a bacterial nature. For best results, it is recommended to eat 1 tablespoon of raw, unprocessed honey and refrain from eating or drinking anything for the next 40 minutes to and hour. Adding orange blossom honey to your tea also works, but it is important to make sure the tea is room temperature or lukewarm because heat destroys the beneficial effects of the honey. In my experience, honey with added propolis works best for bacterial respiratory infections, provided, of course, you are not allergic to either of them. I once had such a bad bacterial infection in my throat that I was prescribed antibiotics from the first day my symptoms debuted. Before starting my therapy that evening, I ate 1 tablespoon of raw honey with added propolis every 3-4 hours, without eating or drinking anything for the next hour. By evening, half of the white spots on my tonsils and back of the throat had disappeared completely and the soreness reduced considerably. So I talked to my doctor and told her I would not be taking the antibiotics, but I would continue with the honey and propolis remedy. She agreed it was a good solution for me at that time, but asked me to keep an eye on the evolution of my symptoms and told me to take the antibiotics if my infection didn’t get any better. But I got better and better and was my normal, healthy self in about 4 days with only honey and propolis. 5) Stimulates appetite. Orange blossom honey is particularly sweet with a citrussy aftertaste and an overall pleasant flavor and fragrance. It contains special enzymes and simple carbohydrates that help digestion and encourage eating, stimulating appetite. 6) Nutritious food. Honey in general is nutritious, despite not having a dense nutritional profile and being rich in natural sugars. All honey varieties are actually quite nourishing, providing essential nutrients such as simple carbohydrates (principally fructose, glucose and other natural sugars), but also trace amounts of amino acids and minerals such as potassium, calcium, copper, zinc, manganese, magnesium and sodium, as well as polyphenolic compounds. Considering its properties, orange blossom honey is a great substitute for refined sugar, candy or artificial sweeteners. However, as a general rule, light-colored honey varieties such as orange blossom or acacia are not as nutritious as dark-colored varieties. 7) Beneficial for skin health. One of my favorite face masks is a simple honey mask. I gently apply raw honey on my face, softly rubbing it in and making it stick. I wait for 15-20 minutes, then wash my face with lukewarm water. My skin looks great afterwards: pores are closed, clean and less visible, the skin has a beautiful glow to it, without being or looking oily and the redness of my acne scars is gone. It even helps keep my acne under control, preventing breakouts. 8) Source of antioxidants. Orange blossom honey is a great source of polyphenolic compounds, notably phenolic acids and flavonoids. These compounds occur naturally in the honey and boast excellent antioxidant and anti-inflammatory properties. Their main role is to protect our cells against damage caused by harmful free radicals, reducing our risks of developing chronic diseases such as cardiovascular disease or degenerative nerve and muscle diseases brought on by extensive cell damage due to oxidative stress. 9) Good for hypoglycemia. Being primarily a source of natural sugars, orange blossom honey is a great tool for fighting hypoglycemia. Whenever I am late eating and feel hypoglycemia installing, I have 1 tablespoon of the honey and get enough energy to keep me going until I can eat. One tablespoon may give me anywhere from 15 to 40 minutes of energy. 10) Low pollen content. Orange blossom honey is estimated to contain a little over 15% pollen, making it a low source of the element and thus less likely to cause allergic reactions than other varieties. However, this does not exclude allergies altogether. If you notice a sensitivity to orange blossom pollen or honey or both or have a history of allergic reactions to pollen in particular, it might be best to avoid the honey and have a skin allergy test to either confirm or rule out a potential allergy.